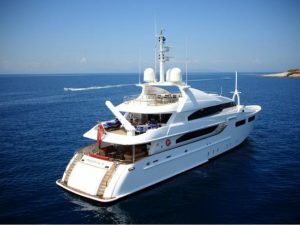 She is acclaimed for her innovative external lines, which are soft and rounded, strongly defining her unique character. 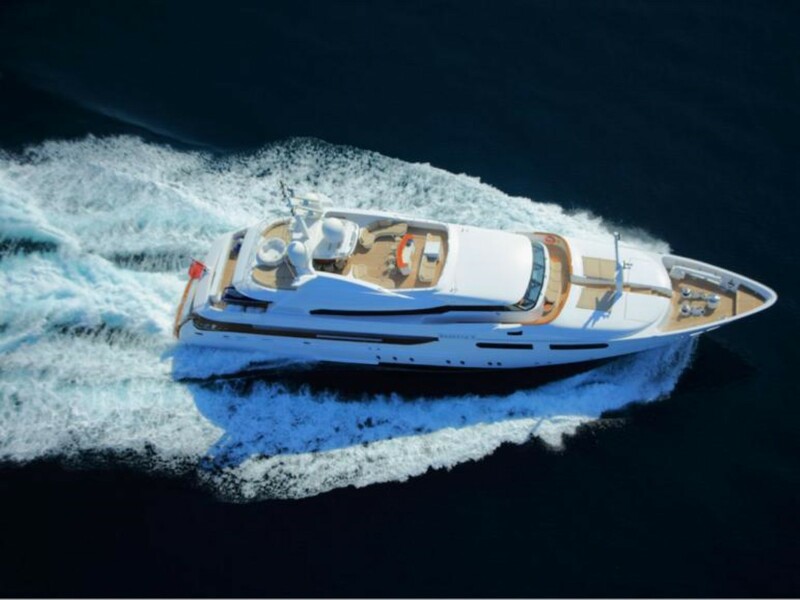 Recognized by their characteristic bow, CRN yachts have always been an undisputed symbol of luxury and prestige. 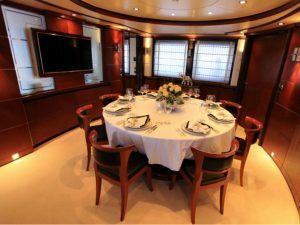 Moreover, their unmistakable “family feeling” has long fascinated the international community and many royal families. 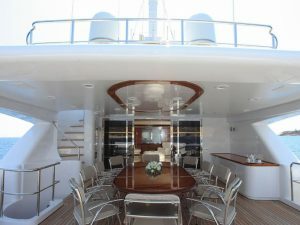 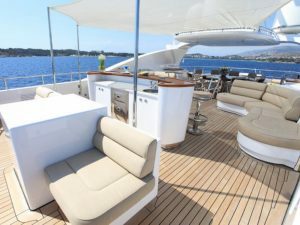 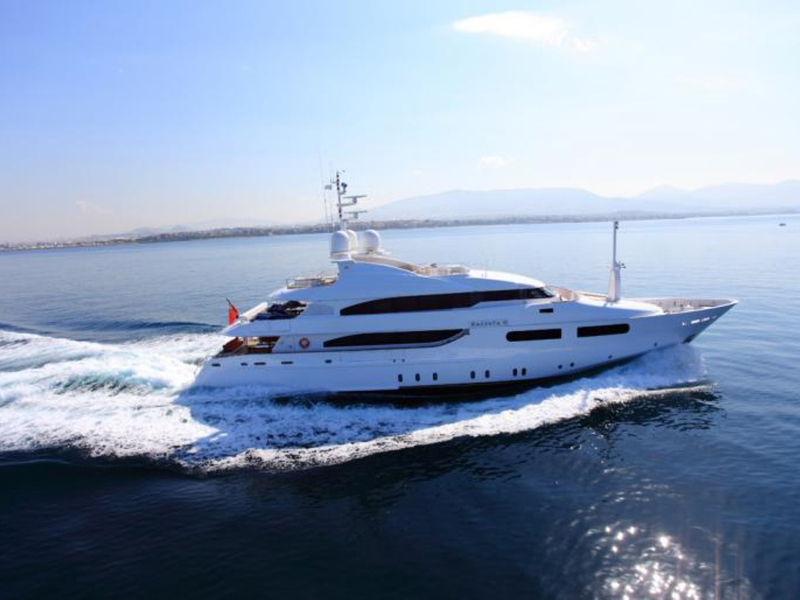 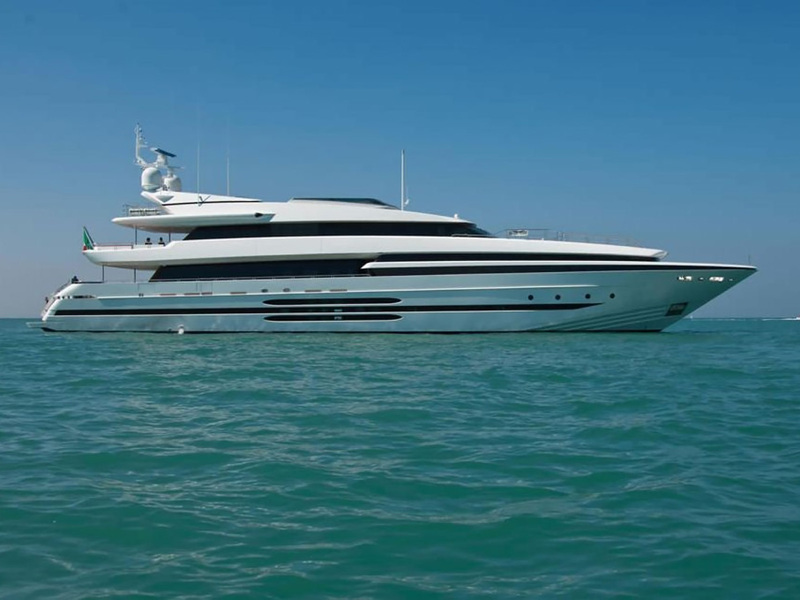 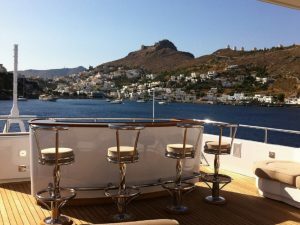 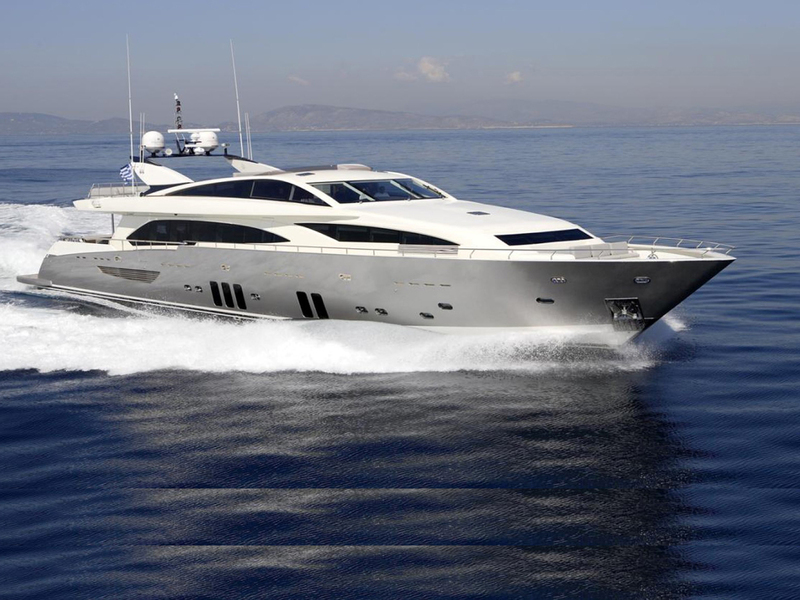 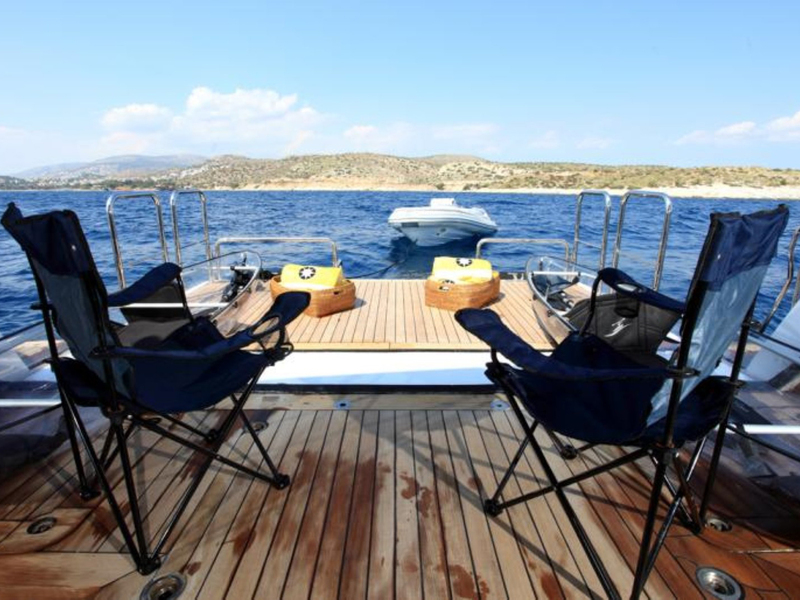 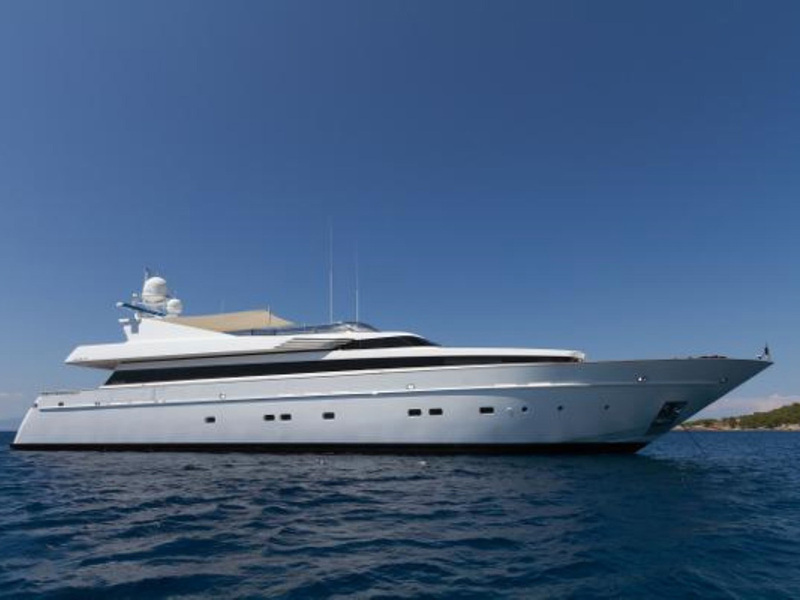 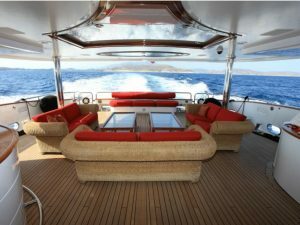 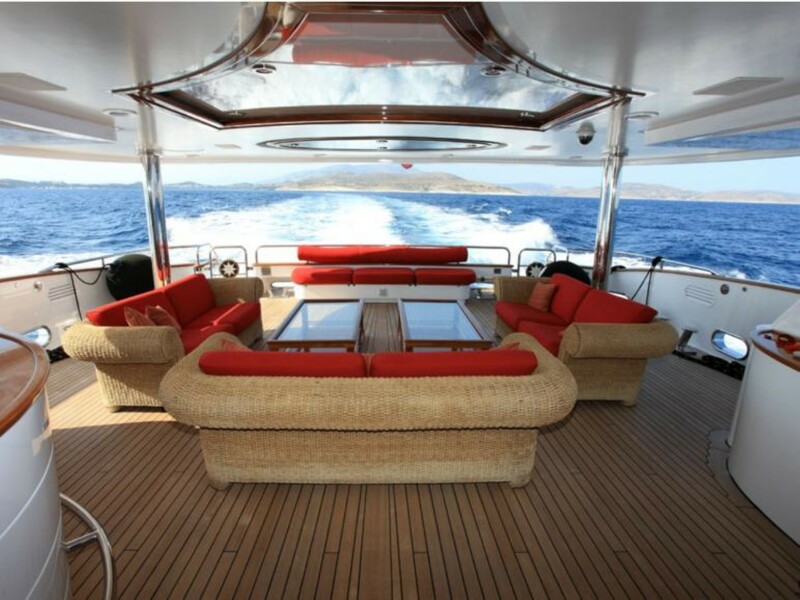 Sleek and elegant, she is an exceptional yacht with immense deck spaces that are ideal for relaxing and entertaining. 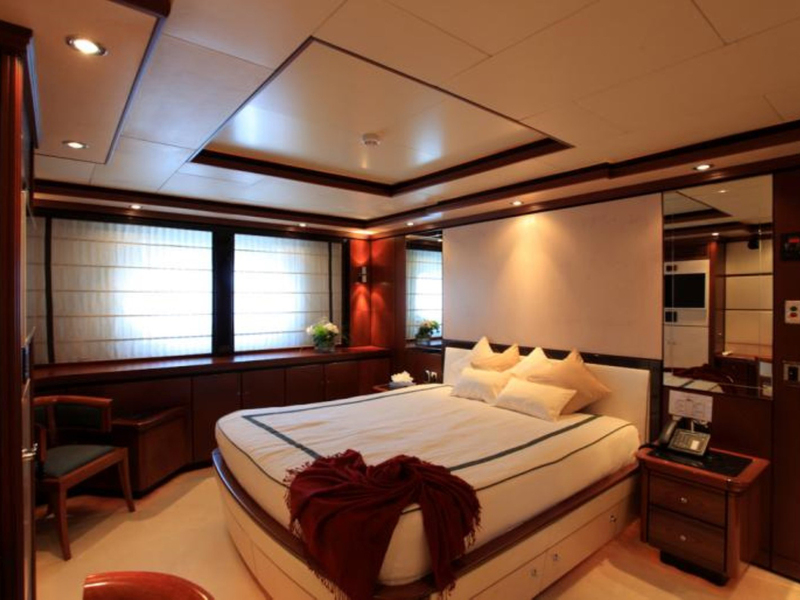 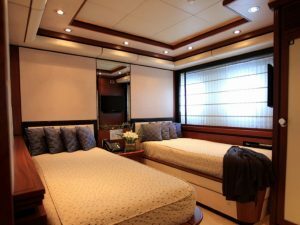 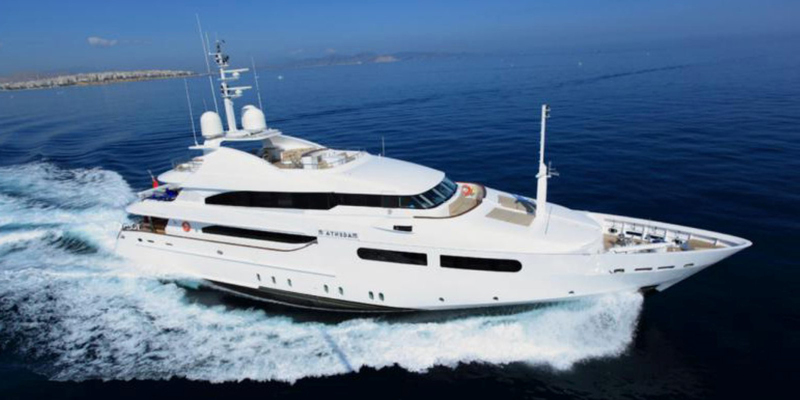 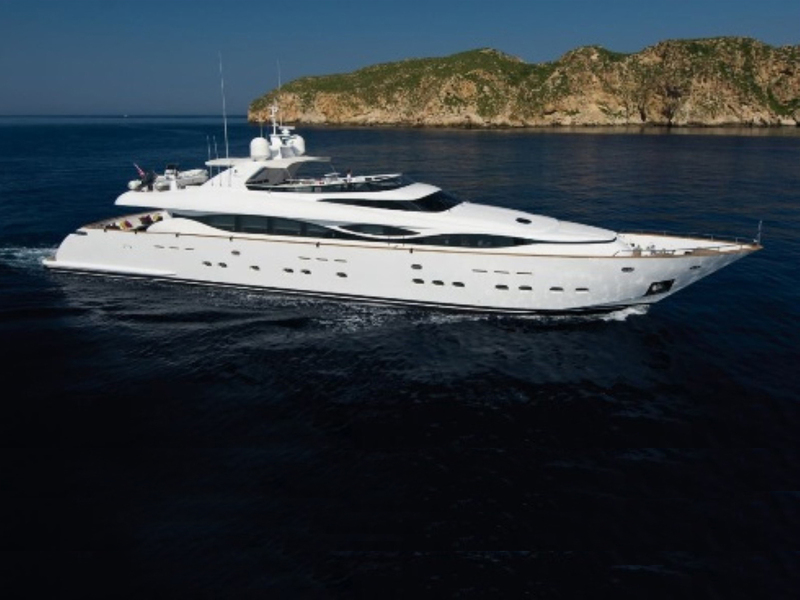 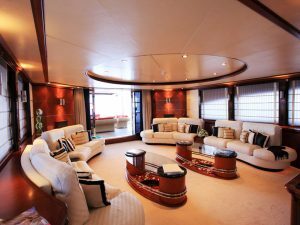 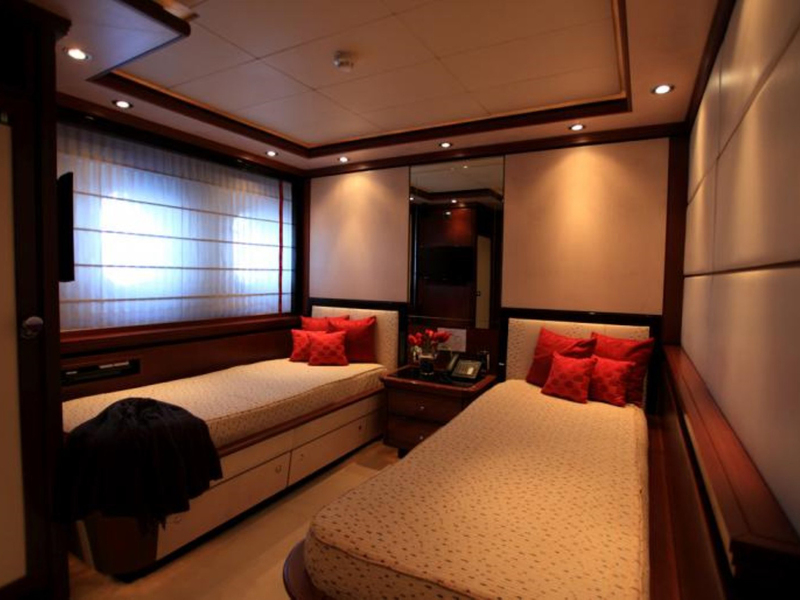 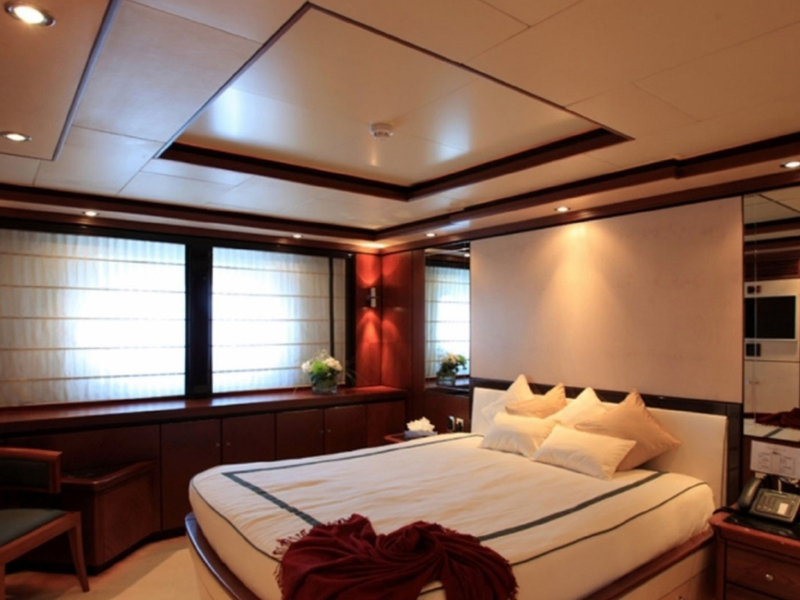 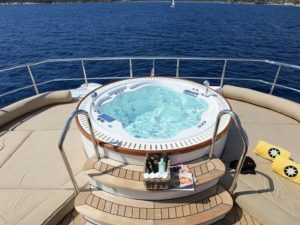 Her excellent outdoor facilities include a large, teak-paneled garage for toys, as well as a Jacuzzi on the sun deck. 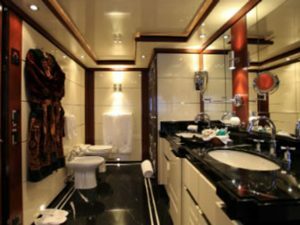 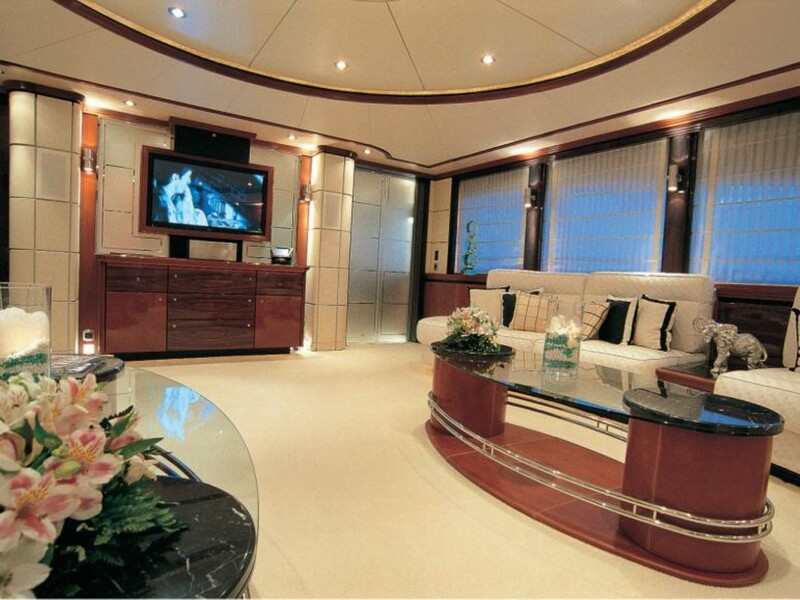 The interior of the motor yacht is based on a theme of sharp contrasts. 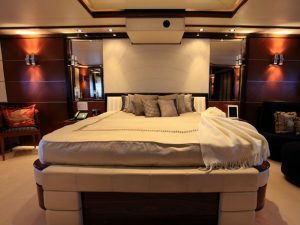 The different fabrics blend together through the constant exchange between antique and modern, marked geometry and flowing fabrics, dark colours and light shades. 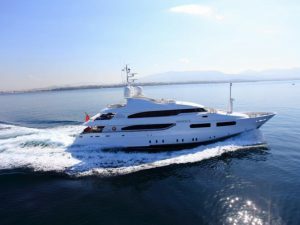 With exceptional volume for a 43m yacht, she is spacious, stylish and modern and incorporates advanced technology which is certainly a distinctive characteristic of this yacht. 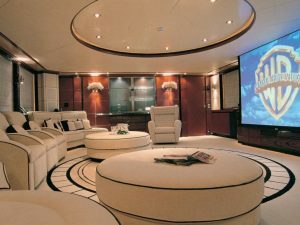 Following the desires expressed by the owner, she is striking for the complexity of its computer and entertainment systems. 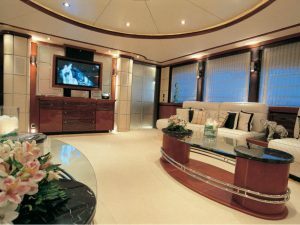 It is a true “motorway of computer science.” One highlight includes the media package featuring the huge projection screens on the top deck, sky lounge and master cabin plus video conferencing, email, fax, GSM and satellite telephones. 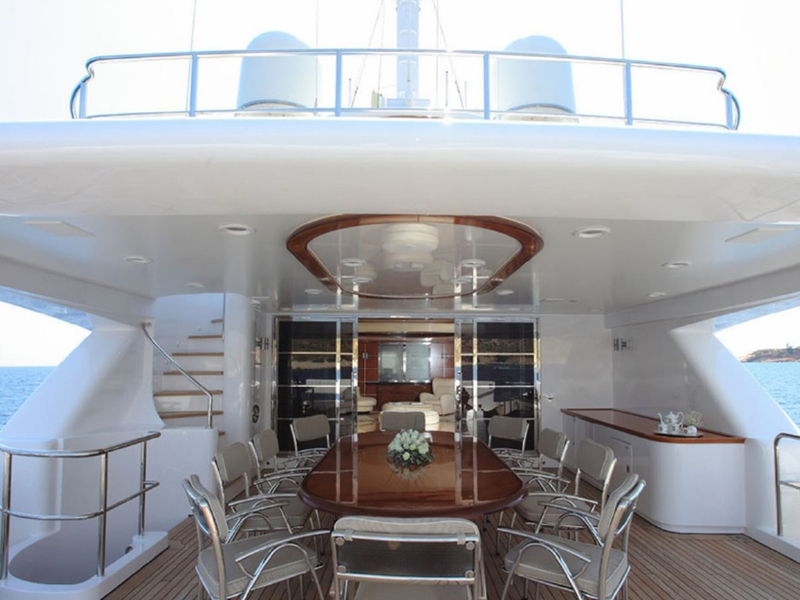 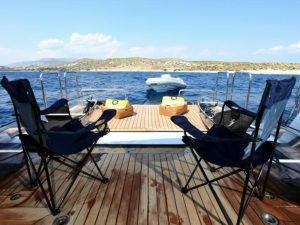 The saloon is light and airy and the immense deck space is ideal for entertaining. 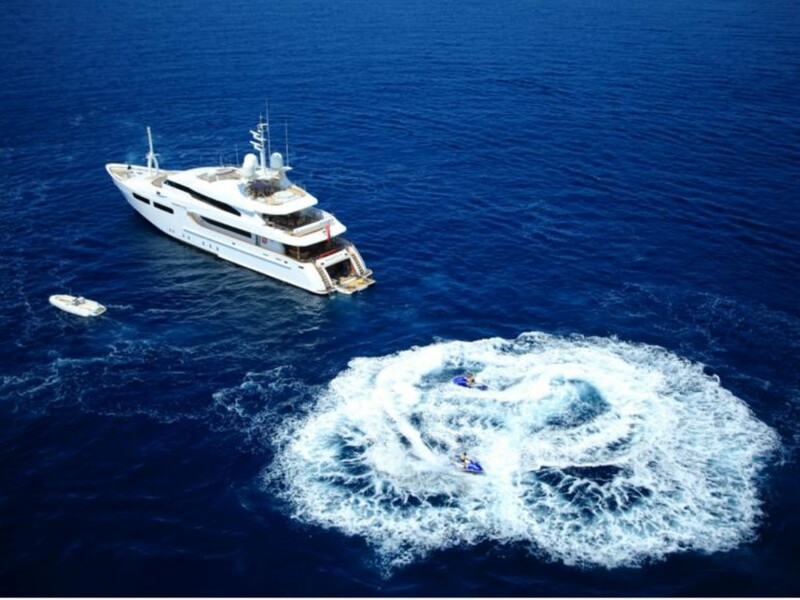 She has a huge range of water sport toys including 1 Novurania 600 LP Yanmar inboard 230 HP, 1 Novurania 360 LP Yamaha Outboard 40HP, 2 Jet Skis Yamaha Waverunner Delux Vx, Diving Equipment for 4 people with Dive compressor, 2 Molokini Kayak (transparent hull), Inflatable trampoline, Wind Surfing Board, Inflatable Banana, Inflatable Donut, Snorkeling Gear, Wake Boards, Water Skis, Various Inflatable water toys and Fishing Equipment. She also features indoor entertainment options such as a Roulette table, a Playstation 3 and Wii.